This weekend I learned that to engage in small talk is to ‘smalk’. 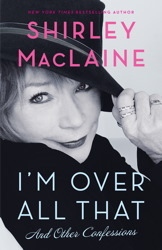 I learned it not by smalking but by reading about it in Shirley MacLaine’s most recent memoir: I’m Over all That. But it was advertised on the library Home page and I was weak and in a mad moment I put a hold on it and when that hold came up, yes, I could have not picked up the book but I was weak again, and hungry—it was just before lunch—and I wasn’t thinking straight. True enough, no one held a gun to my head and forced me to read it on a lounge chair in the sun on Saturday afternoon while nibbling on 85% fair trade and swilling peppermint tea. I chose to. And I’m not apologizing. Just a little embarrassed is all. I mean there are so many, dare I say ‘better’, books to read and many of them are in my house in a stack beside my bed. And yet I choose to read this. In god’s name why? It’s because every now and then a little ‘this’ is good for the soul. That’s why detective novels were invented, no? Anyhoo. Aside from perhaps a bit too much about Hollywood and the fact that she’s been in one sort of relationship or other with most of the men on this planet (and possibly a few others), and aside from her opinion that there are essentially two kinds of people: i) her, and ii) those who have not time-travelled to ancient Egypt… Despite all that she does make some interesting points. She admits America is sorely lacking in world news programming and that Americans, generally, are not global thinkers except to consider how an international event might relate to them. God bless her for that at least. “When I hear the controversy about sending more troops to Afghanistan, nobody but Christiane Amnapour mentions the value and power of the poppy fields and the opium trade. Who wouldn’t want to control the country where as much as 90 percent of the world’s heroin production is located? Why don’t our newscasters get past the point of imposing democracy on another tribal culture and get to the real point of why we’re there? Follow the money, as the old saying goes. Not a bad little rant. But I wouldn’t say this book is her best effort. I read her years ago and remember being slightly more impressed (possibly due to youth). Mostly though, I continue to respect her curiousity and the places it takes her, but not always the way she presents her thoughts as gospel. In any case, I’m Over All That is really just an unconnected collection of casual commentary on many and various subjects—from the alchemy of time (which ancient cultures apparently understood and which we are out of sync with), to the importance of living with a dog, the predictions for 2012, hair colour, funerals, rudeness, exercise, world leaders she has known and loved, politics, live theatre vs film, driving at night—you get the idea. I read somewhere that it came about as a result of lunch with her agent, friend, publisher?? Someone. A lunch during which she’d been idly rattling on about all the things she was ‘over’ until friend, agent, publisher allegedly said: make a book! Overall impression: goes well with lazy afternoon chocolate. Not mind blowing, but a pleasant enough read if you’re in the mood for a rambly one-sided conversation with one of the more interesting people at the party.